After looking around the Bonaventure cemetery, we started looking for restaurants to have dinner. Tam had a list that she had printed from the Internet. We ended up at The Pirate’s House (their web site is: http://www.thepirateshouse.com/,) listed as 7th in Tam’s online recommendations. 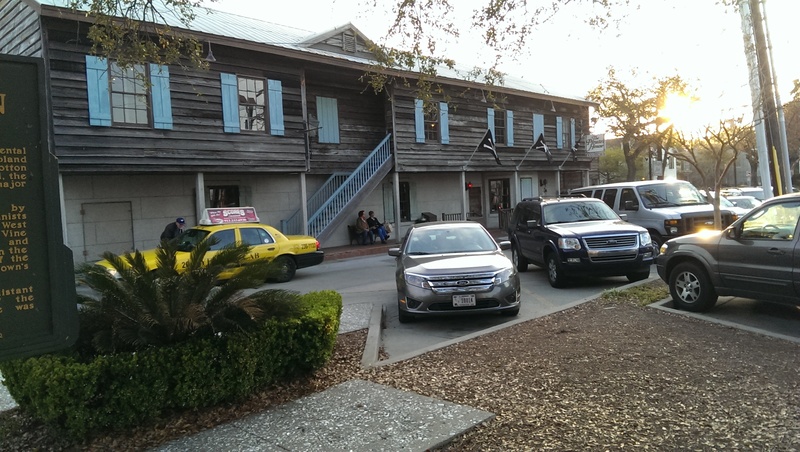 This restaurant was near the Savannah River, next to a large parking lot, so parking wasn’t difficult. There was also a wait there, but not as long, and in fact we were seated in less time than they had predicted. The difficulty was mainly for large parties while small tables went unfilled. The garden ultimately failed but on the site was built an inn for seamen, which became a rendezvous for pirates and sailors. Like the Olde Pink House, there are separate rooms (15 in all), each room with its own history and ambiance; we were in the Captain’s Room. There’s purportedly even a tunnel underneath the Captain’s Room (you can see the shaft from above), used to kidnap unaware sailors (they’d been drugged or were too drunk to know what was going on) to ships waiting in the harbor. The sailor could wake from unconsciousness halfway across the ocean en route to China! An employee (not the waiter) dressed as a pirate comes around to greet customers and gives a tour of The Pirate’s House’s history. He led a few people through the Captain’s Room and told stories surrounding the tunnel, at which time I got up and peered down into the shaft. My dinner was shrimp and crabmeat au gratin, which was delicious. Dale considered having Jambalaya but ended up ordering flounder. I don’t remember what Tam ate. (We like to order different things so we can try each other’s.) I do remember the food being excellent! We could check off one of our required cuisines for this trip: seafood. (The other two were barbecue and Southern cooking). The placemats tell the history of the restaurant.